Our friend Taran Butler recorded a major accomplishment at the 2012 USPSA MultiGun Nationals held April 11-15 in Las Vegas, NV. By winning the 2012 Open Class title, Taran became the first person in history to have won all three USPSA MultiGun divisions: Open, Tactical, and Limited. You can only shoot one division per year at the Nationals, so it’s impossible to hold all three class titles simultaneously. But no other USPSA shooters have won all three class titles over the course of their shooting careers. Not even “immotals” Jerry Miculek or Mike Voight, both multi-time Open-Class winners, have captured all three class championships. Before his Open Class win this year, Butler had previously captured the Tactical Division title four times, and he won the Limited Division back in 2003. 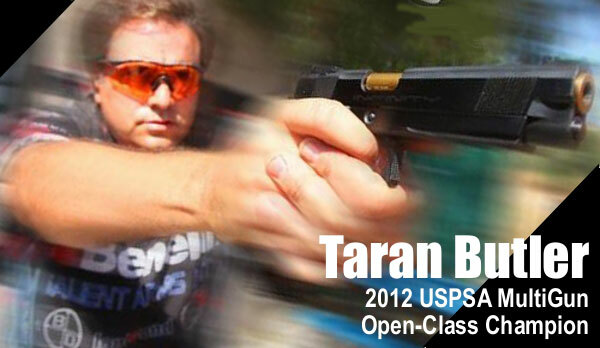 The video below shows Taran accepting a trophy for his 2012 USPSA Open Class victory. Then, starting at the 0:46 mark, you can watch Taran run stages at the recent Nationals. You can see Taran used all three guns: pistol, semi-auto carbine, and shotgun. The pistol Taran used was an Infinity IMM with comp, shooting the standard 9mm Parabellum round. 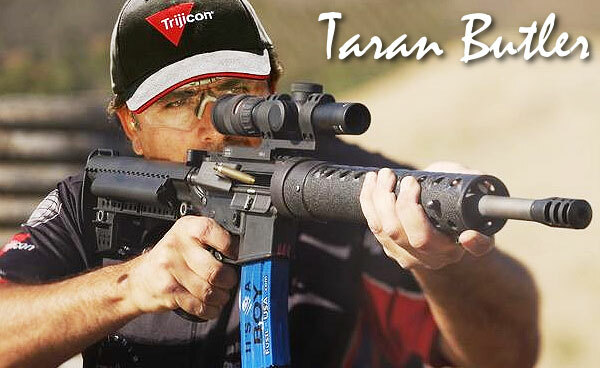 In the shotgun stages in Las Vegas, Taran used a mag-fed shotgun. The shotgun’s huge external magazines (two are sandwiched together) allow long strings with fewer reloads. However, Taran did suffer a major shotgun jam in one stage that cost him 18 seconds (watch video at 4:12 – 4:30). Amazingly, Taran shot a near perfect match after that to win the Open Title. Open Class: “Anything goes” in the Open Class. 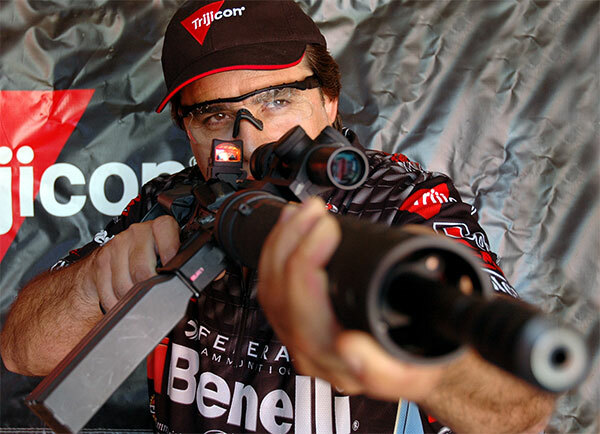 Rifles may have multiple sighting systems including any kind of optics. Pistols may be fitted with comps, optical sights, and very large extended magazines. Limited Class: The Limited Class restricts rifles and pistols to iron sights (or a non-magnified red dot on the rifle only). This class has seen declining participation in recent years. Share the post "With Open Class Win, Butler Secures First Multigun “Triple Crown”"
Limited allows a non magnified red dot on the rifle. IE. Aimpoint or Eotech.